Cut or break lasagna noodles to fit baker. Set aside. 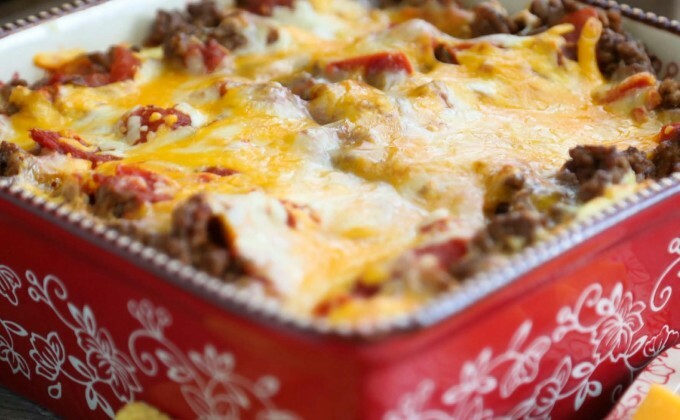 Place ground beef in a skillet over medium-high heat. Cook until no longer pink. Drain and stir in taco seasoning. Set aside. Place two lasagna noodles in the bottom of your 8" x 8" temp-tations® baker. Spread 1/3 of the ricotta mixture on top, followed by 1/3 of the beef, 1/3 of the salsa and 1/3 of the cheese. Continue layering until everything is used up. Loosely cover with foil and bake for 45 minutes. Remove foil and bake for another 5 minutes or until cheese is melted. Let stand for 10 minutes before cutting. Serve with sour cream and green onions if desired.